Friends Countdown: What’s the Friends Quote You Use the Most? It happens when you least expect it. You’re happily playing a friendly game of Taboo, when all you can think is “Paper! Snow! A ghost!” You meet someone’s new boyfriend and pronounce his name in your head as “Josh … ua.” You spot an attractive person across the room and wonder, How you doin’? You hear a news bulletin and immediately murmur, “15 Yemen Road … Yemen.” Friends quotes: They’re tattooed on our brains. The show is of course deeply quotable, but it seems like everyone has a particular quote that sticks with him or her, one that comes up weirdly often. For me, it’s “Miss Chanandler Bong,” because for some reason I get an absurd amount of poorly addressed mail. Perhaps you describe your job as “transpondster,” or perhaps you’re a hand surgeon who dreams of the day she can change her name to “Regina Phalange.” Or maybe, each time you’re about to begin a meal, you think, Custard, good. Jam, good. Meat, gooood. Or is it that you don’t share food? Share this brand-new information: What’s the Friends line you quote the most? 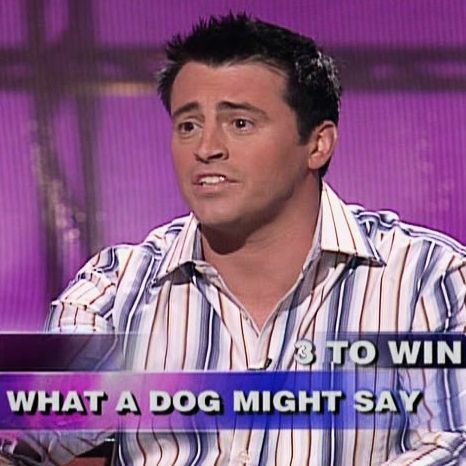 What’s the Friends Quote You Use the Most?